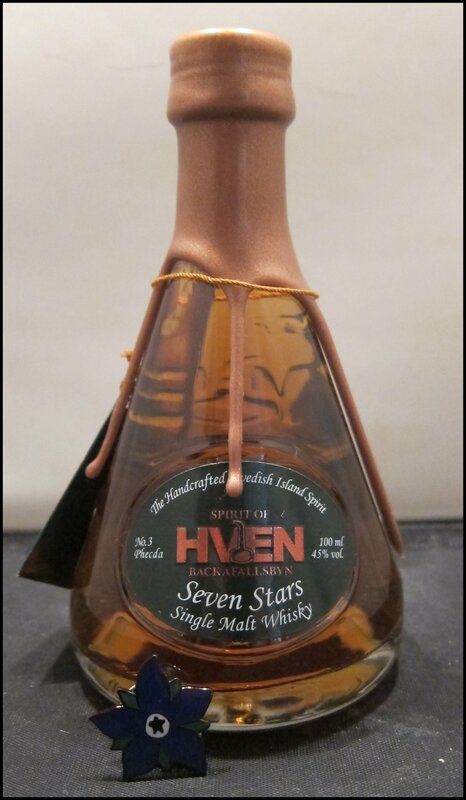 Hven is a family run distillery on a small island of the same name in the Strait between Denmark and Sweden. DTS reviewed their Organic Gin here, but today I’m taking a look at one of their single malt whiskies: Seven Stars No.3: Phecda. It is the third in a limited edition series; one whisky is being released each year until 2019, each of which is named after one of the seven stars in the constellation Ursa Major (the Plough). Phecda follows Dubhe and Merak. The whisky is bottled at the distillery at 45% ABV and is certified organic. Let’s see what it tastes like. Nose: Meaty smokiness on top, with a rich note of ginger underneath – fresh gingerbread and salty seat air. With a bit of warmth and time in the glass, notes of honey and fruity vermouth come through. Taste: Wonderfully smooth. The start is light and silky, followed by a flash of warmth and honey sweetness. Dry flavours then unfold in the form of complex notes of chilli spice, slightly bitter tobacco, and a light nuttiness. Finish: A soft woodiness on top, with dry, complex notes of bonfire smoke underneath. Smooth and well-integrated, with flavours of smoke and berry fruitiness (cranberry and raspberry), followed by cola, a hint of dark chocolate, dry biscuit, and sherry-soaked wood. The finish is dry, smokey, and woody with touches of berry sweetness and a more green, herbal note. Absolutely delicious. Rich Pedro Ximinez spice, berries, and grape and a strong, bonfire smokiness. A complex, but beautiful array of spice, sweet dark sugar, a little fruit cake, and a dash of cherry, but with a the savoury freshness of a red bell pepper. This fades into woody liquorice notes with hints of cream sherry and creamy, dark coffee. A refreshing and complex drink. The soda water lengthens and cools the spirit without masking its complexity. Smooth, sweet notes are followed by deeper, more resinous and lightly smokey wood notes, which are kept bright by the mixer’s effervescence. I think the concept behind the Seven Star whiskies is a brilliant one and No.3 Phecda is wonderful whisky: not too heavy, but with a full flavour profile that develops over time. It also works exceptionally well in all of the cocktails that we tried, although the Old Fashioned stood out in particular.